In practice, School Pyramids do not translate directly into School Boundaries. How do Middle School Boundaries correlate to High School Boundaries? Logic would dictate that the middle school boundary for the Oakton Pyramid (i.e. Carson MS) would encompass the same area. But that’s not the way it works in real life. In practice, most middle school boundaries will have some overlap with their high school boundary, but it’s rarely the same area. What happens when the Carson middle school boundary has some kids that live in the Oakton HS boundary, and some kids that live in a different high school boundary? That’s called a “Split Feed”, because the middle school doesn’t feed all the kids directly into the high school in the same pyramid, but instead, some kids end up going to a different high school, in a different pyramid. Unfortunately, this split feed issue is not restricted to middle schools. Split feeds happen at the elementary school level too. To make matters a little more interesting, many elementary schools are split feeders too. This means that, while they belong administratively to a specific School Pyramid, their boundaries might extend beyond their pyramid’s Middle and/or High School. Let’s take the example of the Beatty family, with their three kids: Emmet, Manny, and Hugh. Emmet goes to Elementary School, Manny goes to Middle School, and Hugh goes to High School. Emmet attends Navy ES (#6 in the first image), which belongs to the Oakton Pyramid. But Louis doesn’t go to Carson MS (which is part of the Oakton Pyramid) because Carson’s boundary doesn’t overlap with Navy’s. Instead, Manny attends Franklin MS (which belongs to the Chantilly Pyramid). Thankfully, Hugh does go to Oakton High School, as expected. Let’s assume that the Beatty’s live in the Fox Mill ES boundary (# 4 in the first image). 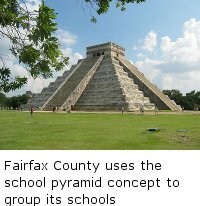 Fox Mill ES belongs to the Oakton Pyramid. Hugh would attend South Lakes HS (and not Oakton HS, as we would expect). Choosing a High School boundary first makes it easier to find a home because the attendance areas are much larger. Once you narrow down your choices to a couple of High School boundaries, then, you’ll want to leave your search open to all the Elementary and Middle Schools that feed into that High School, whether they belong to the same School Pyramid – or not. 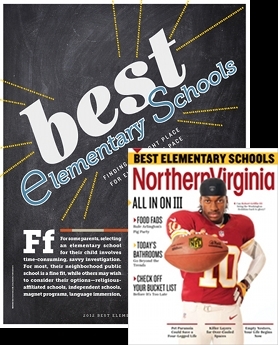 fcps.edu/boundary, and then decide whether the combination of schools is to your satisfaction. If you are interested in a particular combination of schools, we’re happy to activate those boundaries on the interactive map so that you can see where (and if) they overlap. Simply let us know. How much percent of the students goes to Westfield ?